The aim of this study was to evaluate the subclinical influence of uncomplicated cataract surgery on foveal thickness and volume in the early postoperative period in diabetic and nondiabetic patients. Diabetic patients pose a particular challenge because of the tendency for early formation of cataract in them and propensity to develop macular edema after cataract surgery. A prospective nonrandomized study was carried out on 50 eyes of 43 patients, which were divided into two groups. Group 1 included 25 eyes of diabetic patients and group 2 included 25 eyes of nondiabetic patients. Optical coherence tomography was performed to measure initial and 1-month postoperative mean foveal thickness (MFT). Exclusion criteria were as follows: dense cataract that did not permit the measurement of the central macular thickness, proliferative diabetic retinopathy (DR), chronic uveitis, and any posterior segment pathologies other than nonproliferative DR.
MFT increased significantly in both groups. In group 1 it increased initially from 254.88 ± 32.53 to 310.52 ± 64.74 at 1 month postoperatively (P = 0.001). In group 2 it increased initially from 228.28 ± 18.65 to 269.16 ± 23.59 at 1 month postoperatively (P = 0.001). There was no difference in initial logarithm of minimal angle of resolution visual acuity between the two groups: in group 1 it was 0.80 ± 0.05 and in group 2 it was 0.80 ± 0.06 (P = 0.801). Postoperative logarithm of minimal angle of resolution visual acuity was significantly different: in group 1 it was 0.43 ± 0.23 and in group 2 it was 0.25 ± 0.11 (P = 0.001). Increase in MFT occurred after uncomplicated phacoemulsification in diabetic and nondiabetic eyes; the range of increased MFT was more in diabetic patients with higher initial MFT or higher grade of DR preoperatively. Phacoemulsification is the most widely utilized surgical technique that uses ultrasonic energy to remove the lens darkened by cloudy imperfections, and the clouded lens is then replaced with an intraocular lens . Diabetic patients pose a particular challenge because of the tendency for early formation of cataract in them and propensity to develop macular edema after cataract surgery ,. Macular edema (ME) is a major cause of vision loss after cataract surgery in patients with diabetes ,. Optical coherence tomography (OCT) has been established as a practical method for examining retinal architecture. OCT, with its noninvasive nature, has been proven to be an indispensable tool for diagnosing retinal pathologies, including cystoid macular edema (CME). Many studies have reported incidences of CME and macular thickness changes, determined by OCT following uneventful cataract surgeries . ME may be related to impairment of the blood–retinal barrier and an increased susceptibility to surgical trauma in diabetic patients. Other factors that may contribute to the progression of diabetic retinopathy (DR) and possibly to an increased incidence of CME after phacoemulsification in diabetics may include chronic inflammatory mechanisms . Clinically significant macular oedema (CSME) is an important risk factor for decreased vision after cataract surgery. Thus, after cataract surgery, angiographic ME in diabetic patients may be from pseudophakic CME or from diabetic macular edema (DME), and by itself may not be clinically useful in predicting visual acuity (VA); however, macular thickening may be clinically important . Moreover, Kim et al. published reports that the level of DR is a risk factor for thickening of the retina after cataract surgery. The aim of the present work was to evaluate the subclinical influence of uncomplicated cataract surgery on foveal thickness and volume in the early postoperative period in diabetic and nondiabetic patients. A prospective nonrandomized study was carried out on patients attending the Outpatient Clinic of Ophthalmology in Menoufia University Hospital. This study included 50 eyes of 43 patients, which were divided into two groups. Group 1 included 25 eyes of diabetic patients and group 2 included 25 eyes of nondiabetic patients. All included patients underwent preoperative ophthalmological examination, including best-corrected VA, the logarithm of minimal angle of resolution (logMAR) scale for statistical analysis initially and 1 month postoperatively, and slit lamp-assisted biomicroscopy of the anterior and posterior segment to detect the stage of DR and to detect the grade of ME if present under a fully dilated pupil initially and at 1 month postoperatively. OCT was performed to measure initial and 1-month postoperative mean foveal thickness (MFT). Exclusion criteria were as follows: patients with dense cataract that did not permit the measurement of central macular thickness, proliferative DR, chronic uveitis, any posterior segment pathologies other than nonproliferative DR, and intraoperative complications like posterior capsule rupture with or without vitreous loss or dropped nucleus or nuclear fragments, iris trauma, and postoperative inflammation or corneal edema. Data were coded and entered using the SPSS, version 22 (SPSS Inc., Chicago, Illinois, USA). Data were summarized using mean ± SD for quantitative variables and frequencies (number of cases) and relative frequencies (%) for categorical variables. Comparison between values measured preoperatively and postoperatively in the same group was carried out using the paired t-test. Comparisons between groups were carried out using the unpaired t-test when comparing two groups, and analysis of variance with multiple comparisons post-hoc test when comparing more than two groups. For comparing categorical data, the c2-test was performed. The exact test was used instead when the expected frequency was less than 5. Correlations between quantitative variables were determined using the Pearson correlation coefficient. P values less than 0.05 were considered statistically significant. This study was conducted on 50 eyes of 43 patients. The mean ± SD age was 57.48 ± 5.84 in the diabetic group and 56.88 ± 4.72 in the control group [Table 1]. There were 15 female patients and 10 male patients in the diabetic group and 11 female patients and 14 male patients in the control group [Table 2]. They were divided into two groups: group 1 and group 2. Group 1 consisted of 25 eyes of diabetic patients and group two consisted of 25 eyes of nondiabetic patients. OCT was performed for all patients initially and at 1 month postoperatively to evaluate the MFT in each group. In the diabetic group, the MFT increased significantly from 254.88 ± 32.53 initially to 310.52 ± 64.74 at 1 month postoperatively (P = 0.001) [Table 3]. In the control group, the MFT increased significantly from 228.28 ± 18.65 initially to 269.16 ± 23.59 at 1 month postoperatively (P = 0.001) [Table 4]. There was no difference in the initial logMAR VA between the two groups: in group 1 it was 0.80 ± 0.05 and in group 2 it was 0.80 ± 0.06 (P = 0.801) [Table 5]. The postoperative logMAR VA was significantly different: in group 1 it was 0.43 ± 0.23 and in group 2 it was 0.25 ± 0.11 (P = 0.001) [Table 5]. There was no difference in the initial MFT between the two groups: in group 1 it was 254.88 ± 32.53 and in group 2 it was 228.28 ± 18.65 (P = 0.402) [Table 5]. The postoperative MFT was significantly different: in group 1 it was 310.52 ± 64.74 and in group 2 it was 269.16 ± 23.59 (P = 0.005) [Table 5]. There was a statistically significant correlation between postoperative MFT and staging of DR in the diabetic group (P = 0.001) [Table 6]. There was a positive correlation between preoperative MFT and postoperative MFT in the diabetic group (r = 0.859, P < 0.001) [Table 7]. This study has demonstrated that MFT, after uncomplicated phacoemulsification, in diabetic patients increases significantly at 1 month postoperatively, and there is a greater increase in MFT in diabetic patients with a higher grade of DR and with higher initial MFT. Oh et al. showed that diabetic patients may be susceptible to developing postoperative subclinical retinal swelling or clinical ME after cataract surgery. Dowler et al. showed that DME progressed in ∼20–40% of eyes that underwent cataract surgery, but in a considerable percentage of these eyes the ME resolved spontaneously. Accordingly, these studies suggested that progression of DME may be classified as follows: a transient pseudophakic ME (Irvine–Gass syndrome) or a substantial progression of diabetic maculopathy. Moreover, the study has demonstrated that MFT in nondiabetic patients after uncomplicated phacoemulsification increases significantly at 1 month postoperatively, and MFT increases more significantly in diabetic patients than in the control group at 1 month postoperatively. The pathogenesis of ME is associated with the destruction of the blood–aqueous barrier and the blood–retinal barrier induced by prostaglandins or other inflammatory mediators . Elevated levels of angiogenic factors, inflammatory cytokines, chemokines, and growth factors in the aqueous humor may play a role in the breakdown of the vascular barrier . El-Sobkya et al. showed that uncomplicated phacoemulsification does not cause acceleration of DR postoperatively. Moreover, ME, which is common after cataract surgery, may follow a benign course and any progression that is observed postoperatively probably represents natural progression rather than being a direct effect of surgery . Regarding best corrected visual acuity (BCVA), no statistically significant difference was found between the diabetic and control groups preoperatively, but there was a statistically significant difference between the diabetic and control groups regarding BCVA at 1 month postoperatively. However, BCVA in both the diabetic and control groups has shown significant improvement after 1 month postoperatively. Eriksson et al. showed that the visual outcome in diabetic eyes with mild to moderate retinopathy is as good as in the control group 6 months after cataract surgery. However, at 6 weeks there was a significant difference, with lower VA in eyes with DR combined with a higher frequency of macular changes both on fluorescein angiography and on OCT, when compared with the control group. Kim et al. found a good correlation between BCVA and retinal thickening. However, other reports show only a moderate correlation between central retinal thickness and VA in patients with DME, implying that VA may depend mainly on the disruption of the retinal architecture or on direct photoreceptor damage ,. Increase in central macular thickness occurs after uncomplicated phacoemulsification either in diabetic or in nondiabetic patients; the range of increased central macular thickness is more in diabetic patients, especially in patients who already have higher central macular thickness or higher grade of DR initially. Despite increased MFT, BCVA improved postoperatively in both groups. It is therefore important to distinguish which specific factors in individual patients who develop CME are vital, so that targeted therapies may be developed. It is also equally important to diagnose CME without delay because early diagnosis means early treatment, which in turn is associated with a better prognosis for better visual outcome. Luo L, Lin H, Chen W, Qu B, Zhang X, Lin Z, et al. Intraocular lens-shell technique: adjustment of the surgical procedure leads to greater safety when treating dense nuclear cataracts. PLoS One 2014; 9:e112663. Nelson ML, Martidis A. Managing cystoid macular edema after cataract surgery. Curr Opin Ophthalmol 2003; 14:39–43. Ray S, D'Amico DJ. Pseudophakic cystoid macular edema. Semin Ophthalmol 2002; 17:167–180. Von Jagow B, Ohrloff C, Kohnen T. Macular thickness after uneventful cataract surgery determined by optical coherence tomography. Graefes Arch Clin Exp Ophthalmol 2007; 245:1765–1771. Joussen AM, Poulaki V, Le ML, Koizumi K, Esser C, Janicki H, et al. A central role for inflammation in the pathogenesis of diabetic retinopathy. FASEB J 2004; 18:1450–1452. Escaravage GK Jr, Cohen KL, Patel SB, Hartnett ME, Armstrong BD, Janowski CM. 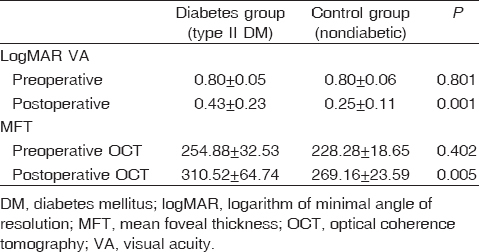 Quantification of macular and optic disc hyperfluorescence after phacoemulsification in diabetes mellitus. J Cataract Refract Surg 2006; 32:803–811. Kim SJ, Equi R, Bressler NM. Analysis of macular edema after cataract surgery in patients with diabetes using optical coherence tomography. Ophthalmology 2007; 114:881–889. Oh JH, Chuck RS, Do JR, Park CY. Vitreous hyper reflective dots in optical coherence tomography and cystoid macular oedema after uneventful phacoemulsification surgery. PLoS One 2014; 9:e95066. Dowler JGF, Sehmi KS, Hykin PG, Hamilton AMP. The natural history of macular edema cataract surgery in diabetes. Ophthalmology 1999; 106:663–668. Belair ML, Kim SJ, Thorne JE, Dunn JP, Kedhar SR, Brown DM, Jobs DA. Incidence of cystoid macular edema after cataract surgery in patients with and without uveitis using optical coherence tomography. Am J Ophthalmol 2009; 148:128–135. Funatsu H, Yamashita H, Ikeda T, Mimura T, Eguchi S, Hori S. Vitrous levels of interleukin-6 and vascular endothelial growth factor are related to diabetic macular edema. Ophthalmology. 2003; 110:1690–1696. El-Sobkya HM, El-Sebaeya AR, El-Hagaab AA, Gaber NK. Evaluation of the progression of diabetic retinopathy after phacoemulsification. Menouf Med J 2014; 27:643–649. Eriksson U, Alm A, Bjärnhall G, Granstam E, Matsson AW. Macular edema and visual outcome following cataract surgery in patients with diabetic retinopathy and controls. Graefes Arch Clin Exp Ophthalmol 2011; 249:349–359. Nunes S, Pereira I, Santos A, Bernardes R, Cunha-Vaz J. Central retinal thickness measured with HD-OCT shows a weak correlation with visual acuity in eyes with CSME. Br J Ophthalmol 2010; 94:1201–1204.